앵글 매거진의 주요 행사가 다시 찾아왔습니다. 오디오-비주얼 페스티벌은 저번 회에 잠시 중단되었다가, 가장 큰 라인업으로 웅장하게 돌아옵니다. 4월 28일, 부산대학교 근처 4곳에서 열리며, 한국에서 지내며 작업 활동을 하는 작가들을 기립니다. 빅 데이 사우스는 지역 사회를 위한 공간을 만들고 공동 작업을 하며 사람들이 한국 전역에서 하는 일에 대해 감사합니다. 관객들은 행사의 사진이나 비디오를 #빅데이사우로 해시태그하여 공유해주시고 인터랙티브 아트를 최대한 이용하면 즐겁게 춤을 즐기시면 됩니다. 부산에는 훌륭한 아티스트들과 파티를 하는 것이 기대가 됩니다. Angle Magazine’s flagship event is coming home. The audio-visual festival returns with a bang after a one year hiatus, with the biggest line-up to date. Taking place on April 28th in four venues around the PNU area of Busan, the festival celebrates the creatives who live and work in the southern half of the country. Big Day South creates a space for community, collaboration, and appreciation of the great stuff people make and do all over Korea. 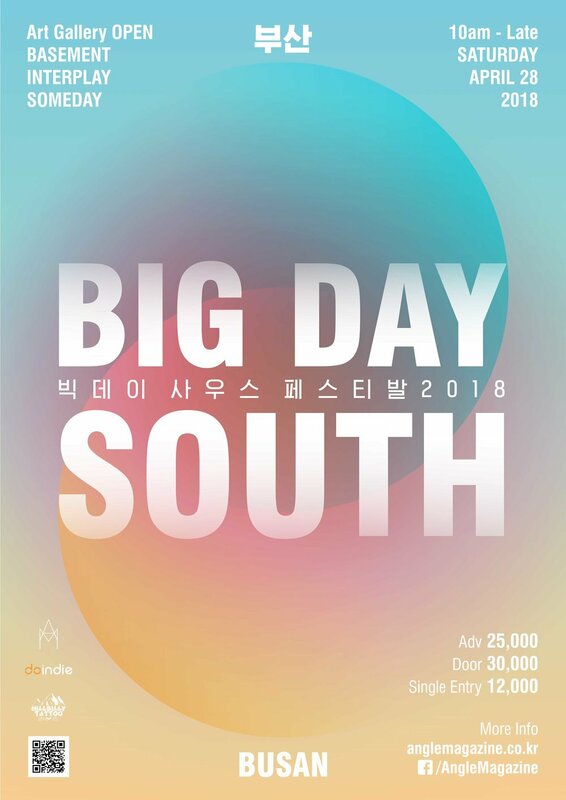 Audience members are encouraged to share their photos or video of the event under the #bigdaysouth hashtag, take full advantage of interactive art, and of course, dance their asses off. We can’t wait to party in Busan with all these great artists and you.